Environmental degradation is the main cause for many health problems including communicable and chronic diseases. There is a lack of infrastructure to support dense urban populations. 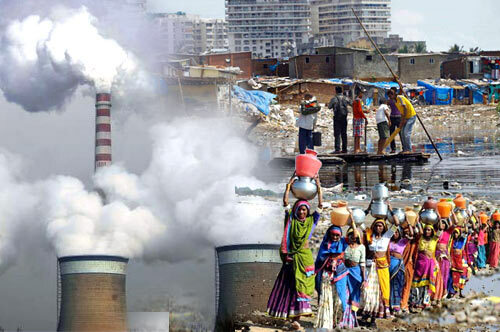 A country’s environmental problems alter with its stage of development, structure of its economy, its environmental policies and production technologies in use. While some problems may be related with the dearth of economic development (e.g. inadequate sanitation and clean drinking water), others are aggravated by the growth of economic activity (e.g. air and water pollution). Poverty presents special problems for a densely populated country with limited resources. India is a complex, stunningly diverse country replete with seeming denial. It has a powerful education ethic indicated by a significant segment of the population holding advanced degrees, still also huge poverty and illiteracy. India is known as world‘s largest democracy, still poor execution of laws and corruption are widespread. Its population is largely Hindu, a faith noted for peace, harmony, care for the poor, and vegetarianism, exceptionally in the version embraced by Mahatma Gandhi, considered the father of modern India. Still India has deep- rooted social divisions, most especially in the ―untouchable caste relegated to jobs such as handling human waste. India might be the ultimate test case of how many people one can squeeze into a given area and still provide a decent, modern life-style. Currently, India ranks 101 out of 146 countries on the 2005 Environmental Sustainability Index (ESI), which ranks countries based on such measures as health, technology, governance and international cooperation combination of traditional thinking, anti-colonialism, and socialist policies guided India, which correlated with an extremely slow rate of economic growth, about 3.5% annually, or a miserly 1.5% per capita from 1950 to 1980. This mindset, which seems to undermine development and modernity, has been under charge since the reign of Indira Gandhi in the era of 1970s, and even much more beginning in 1991, when an economic crisis brought ―external sector liberalization, reforms of taxation and the financial sector, deregulation of industry and a more commercial approach. It has been criticized as rewarding a relatively small population segment and growing income inequality. Furthermore, environmental problems might endanger or halt this growth. A 1995 report, for instance, estimated that ―annual losses due to the environment are of the order of 4.5%.‖A National Population Policy adopted in 2000 ―emphasizes promoting contraceptive use among eligible couples‖ and aims ―to improve the health of women and their children. Overall, the policy moves ―from achieving demographic targets toward meeting the reproductive health needs of clients‖ (Ibid). Erosion by water and wind is the most significant contributor to soil erosion with other factors like water logging, salination etc., are adding to the in situ degradation. While soil erosion by river and rain in hill areas causes landslides and floods, overgrazing, traditional agricultural practices, deforestation, mining and incorrect siting of development projects in forest areas have resulted in opening up of these areas to heavy soil erosion. Forests are a renewable resource and contribute substantially to the economic development by providing goods and services to forest dwellers, people at large and forest based industries, besides generating substantial volume of employment. The country has a very diverse forest vegetation ranging from the moist evergreen forests in the North-East, along the West Coast and the Andaman & Nicobar Islands to the temperate and alpine vegetation in the Himalayas. The Country’s unique phyto-geographical and agro-ecological diversity endows it with a wide variety of agro climatic zones that harbor a rich repository of biological resources. The three most popular solutions were planning, infrastructure, and legislation (composing in total 51% of the answers). According to the categorization of Jacobi et al. (1998), these results are direct action at the governmental level. Education which is considered as an indirect governmental action was chosen by 5% of the participants, whereas individual and community solutions were rare (for example, 3% chose activism). Although the solutions to local environmental problems are mainly governmental, according to the participants this is not the case regarding the causes of the problems. Thirty percent of the participants asserted that “society” (the general public or individuals) was the source of the problems they stated. This finding is similar to that of Mogensen and Nielsen (2001). The solution for the sewage problem is overwhelmingly infrastructure (81%), and the solution for the open spaces problem is planning (54%). Additional issues such as water pollution and solid waste were not given one massive solution. Solid waste was the only problem which a remarkable percentage of students (18%) thought should be resolved via education. Regarding the association between the problems and the causes, there was one, specific, popular cause for almost every problem: solid waste is produced by society, open spaces are damaged by development, air pollution is the outcome of industry, and sewage problems are caused by faulty infrastructure.